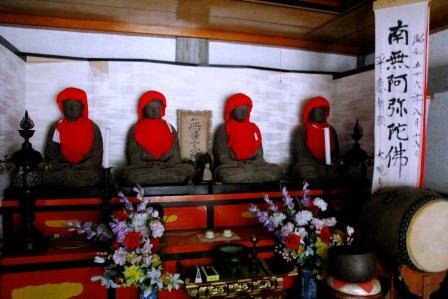 The 4 Buddha statues of a height of about 82 cm that are enshrined at the Daikou-in temple in Nishifunabasama, Shibata-machi. It is said that these statues sweat waterdrops when there is imminent disaster to the village and is also called "sweating Buddha". The iron Buddha has a carving that says the 3rd year of Bunei period (1266) and is a cast from the Kamakura period (circa 1185-1333). Once upon a time, a daughter of a power and rich family was suffering from illness. A monk who was journeying was consulted at that time, and was told that the "reason for the daughter's illness was the large snake living in the swamp". The monk continued and said "Create one ship and 5 steel statues of the Amidanyorai and sink these in the swamp and the daughter would get better". When they did as the monk suggested, the daughter recovered from her illness, and after pulling out only the 4 Amidanyorai statues, these were used to collect more faith from the people.